Mountain openings are an interesting topic in the snow community, especially Colorado mountains. You may ask yourself,” Why are mountain openings in Colorado so different than other place around the nation?” And the answer is because of our diverse location and consumer base. Here in Colorado, our mountains are a mere hour and a half from a major city, and short hour and a half from a booming college town and a quick bus ride from one of the best mountain towns in America. So with all that said all types of riders make the journey out to hit the slopes. Opening weekend at Keystone is a fantastic experience that without being there is hard to believe. 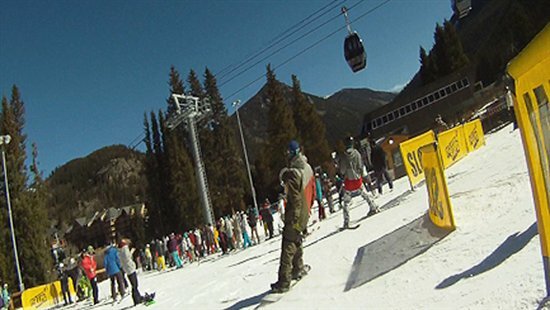 By the time Keystone opened, Arapahoe Basin had already been in operation for a few weeks, yet the herds of people still flocked in. Is it because of the welcoming gondola? The various locations and means to getting up the slopes? The great long steep runs to the bottom? Or first real terrain park to be in operation with an impressive 28 features? And obviously all of these are the reason. The perfectly maintained park draws in everyone from families with kids that want to learn how to hit boxes, to the college kid that’s been waiting to hit their first rail, to the Denver local who wants to practice their tricks for when snow hits the town. The long slopes allow everyone to get their snow legs back and remember the burn we all grow so accustomed to. No matter who is there, or what they’ve come to do at Keystone everyone is there for the same reason; because we love snow! So yes opening weekend may be a bit crowded, but a 15 minute lift line with all sorts of people who share the same passion and love isn’t a bad thing. If anything it’s an opportunity to meet new people, see familiar faces, and enjoy the sun with a bunch of great people. Keystone resort opening weekend is what it’s all about, good snow, good people, and a great place to be.